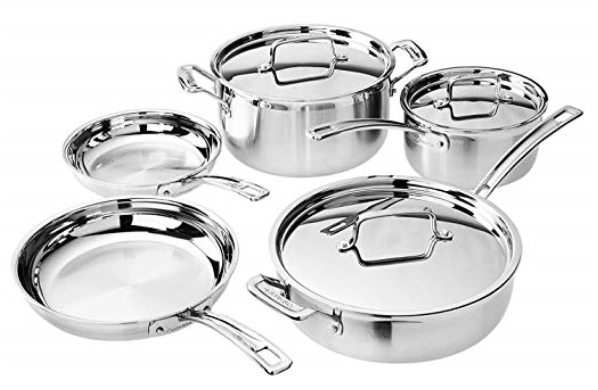 Amazon Daily Deal: Cuisinart Multiclad Pro Cookware, 8 Piece Set – $129.99, Best Price! As one of its deals for today only (Monday, February 18th), Amazon is offering this beautiful 8-piece Cuisinart Multiclad Pro Cookware for just $129.99, down 35% from the regular price of $200. This set includes: 2.5 Quart Saucepan with Lid, 4 Quart Saute Pan with Helper and Cover, 6 Quart Stock Pot with Cover, 8″ Skillet, 10″ Skillet. Some customers mention throwing these in the dishwasher without incident, but it’s recommended that only the covers go in the dishwasher. The stainless steel finish does not react with food, or alter flavors. Several customers remarked that the cookware was easy to care for. You can put these in the oven up to 500°, which is perfect for taking dishes from the stove to finish in the oven. Cuisinart provides a lifetime warranty on these products! Remember, this special pricing is good today only (2/18) or while supplies last. Head to Amazon to snag yours now! I am thinking I saw them at Costco for $169 down from $199 over the wknd. Very nice looking and a good weight to them. $129 is a great price!